Here are some snazzy birthday facts about 30th of May 2007 that no one tells you about. Don’t wait a minute longer and jump in using the content links below. Average read time of 10 minutes. Enjoy! What day was my birthday May 30, 2007? May 30, 2007 was a Wednesday and it was the 150th day of the year 2007. It was the 22nd Wednesday of that year. The next time you can reuse your old 2007 calendar will be in 2029. Both calendars will be exactly the same! This is assuming you are not interested in the dates for Easter and other irregular holidays that are based on a lunisolar calendar. 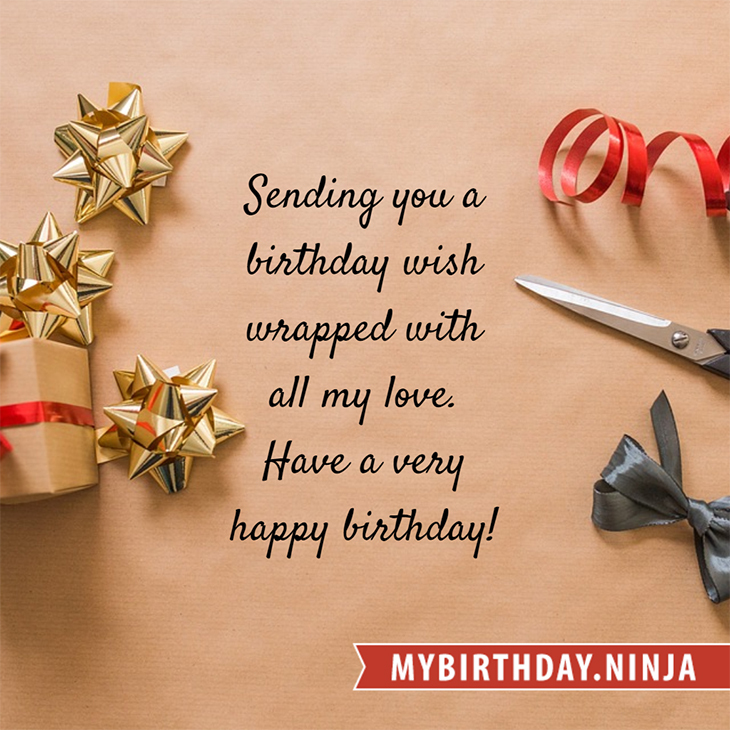 There are 38 days left before your next birthday. You will be 12 years old when that day comes. There have been 4,345 days from the day you were born up to today. If you’ve been sleeping 8 hours daily since birth, then you have slept a total of 1,448 days or 3.97 years. You spent 33% of your life sleeping. Since night and day always follow each other, there were precisely 148 full moons after you were born up to this day. How many of them did you see? The next full moon that you can see will be on May 18 at 21:13:00 GMT – Saturday. Fun stat: Your first one billion seconds (1,000,000,000) will happen sometime on February 5, 2039. If a dog named Zhazha - a Black and Tan Coonhound breed, was born on the same date as you then it will be 69 dog years old today. A dog’s first human year is equal to 15 dog years. Dogs age differently depending on breed and size. When you reach the age of 6 Zhazha will be 42 dog years old. From that point forward a medium-sized dog like Zhazha will age 4.5 dog years for every human year. Hussite Wars: Battle of Lipany: Effectively ending the war, Utraquist forces led by Diviš Bořek of Miletínek defeat and almost annihilate Taborite forces led by Prokop the Great. Future U.S. President Andrew Jackson kills Charles Dickinson in a duel after Dickinson had accused Jackson’s wife of bigamy. Pearl Hart, a female outlaw of the Old West, robs a stage coach 30 miles southeast of Globe, Arizona. At the Indianapolis Motor Speedway, the first Indianapolis 500 ends with Ray Harroun in his Marmon Wasp becoming the first winner of the 500-mile auto race. World War II: One thousand British bombers launch a 90-minute attack on Cologne, Germany. Former Liberian president, Charles Taylor, is sentenced to 50 years in prison for his role in atrocities committed during the Sierra Leone Civil War. What does my birthday May 30, 2007 mean? Your birthday numbers 5, 30, and 2007 reveal that your Life Path number is 8. It represents experience, authority and endeavour. You are gifted with natural leadership and the capacity to accumulate great wealth. The following celebrities also have the same life path number: Maizie Williams, Matet de Leon, Asami Tada, Kati Kovács, Norrie Paramor, Emma Rigby, Bekim Fehmiu, Jason Castro, Amy Lee, Bizzy Bone. 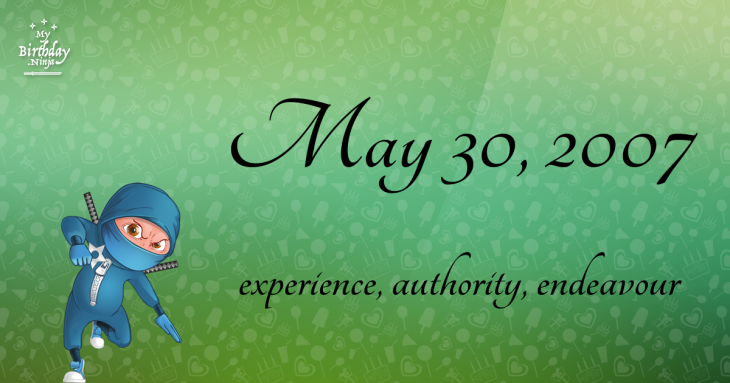 What is the birthday horoscope for May 30, 2007? The Western zodiac or sun sign of a person born on May 30 is Gemini ♊ (The Twins) – a mutable sign with Air as Western element. The ruling planet is Mercury – the planet of communication. According to the ancient art of Chinese astrology (or Eastern zodiac), Pig is the mythical animal and Fire is the Eastern element of a person born on May 30, 2007. Fun fact: The birth flower for 30th May 2007 is Lily of the Valley for purity. The number-one hit song in the U.S. at the day of your birth was Makes Me Wonder by Maroon 5 as compiled by Billboard Hot 100 (June 2, 2007). Ask your parents if they know this popular song. How many babies were born on May 30, 2007? Base on the data published by the United Nations Population Division, an estimated 136,581,093 babies were born throughout the world in the year 2007. The estimated number of babies born on 30th May 2007 is 374,195. That’s equivalent to 260 babies every minute. Try to imagine if all of them are crying at the same time. What is the popular baby name on 30 May 2007? Here’s a quick list of all the fun birthday facts about May 30, 2007. Celebrities, famous birthdays, historical events, and past life were excluded. Try another birth date of someone you know or try the birthday of these celebrities: March 16, 1954 – Tim O'Brien, American singer-songwriter and guitarist (Hot Rize); September 12, 1951 – Ali-Ollie Woodson, American singer-songwriter, keyboard player, and actor (The Temptations) (d. 2010); March 10, 1994 – JoJo Offerman, American wrestler and singer.